When you have no water call H2O Services. Upon arrival we’ll ask you a couple of questions so we can starter putting information together to trouble shoot your system. Our technicians use the meters that they were factory trained with. We want to find what is wrong and why it has failed. Not every job requires a new pump but if you do we stock a full line of pumps. Our service crew is knowledgeable and courteous. You will be given a free estimate and all your questions answered to your satisfaction (We thrive on input from our customers) before any work starts. We take great pride in our work so along with the manufacture’s 5 year warrantee on defects we add a 3 year labor warranty if the pump fails due to a defect. The work is only complete when you are 100% satisfied. Constant Pressure system are great for large homes and homes with irrigation systems. These systems deliver a constant pressure whether you’re just brushing your teeth or if two showers are running along with the irrigation system. We use mostly Goulds jet pumps. I find them to be the most durable in the industry. Pre 1970 many wells were left finished in a “well pit” or man hole. This was to allow access to the well and keep it from freezing. There was no code on how this well pit was to be constructed. Some pits have a concrete cover that is at grade and is easy to see, others are buried and have no markers or are not described on a map. 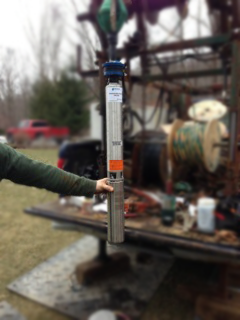 We use a “Line Detector” and years of experience to locate a well. Some wells are found in minutes other can take hours. A boost pump may be the solution to your low pressure problems. When drilling your well deeper or a new one due to a low yield problem is not the answer, we can put water storage system in your basement that will accommodate your needs. Jet pumps have their applications but today's homes have a great demand for water and for this a submersible well pump is the most effective tool to deliver the volume and pressure required for the demanding homeowners life style.